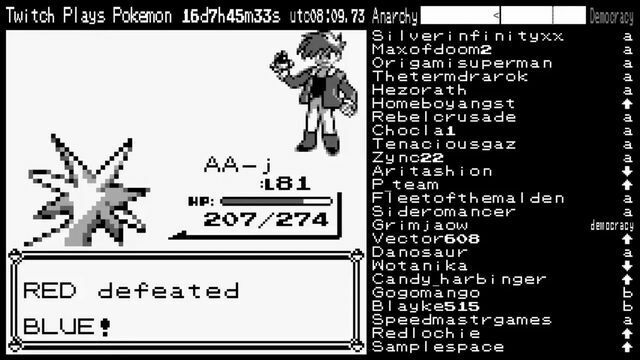 On Feb. 12, 2014, Twitch Plays Pokémon began with a strange but simple premise. The pitch: A Twitch bot would play and complete Pokémon Red, controlled entirely by viewers who ordered the bot to press certain buttons by typing commands in the live chat. Chaos of the most entertaining order broke out. Thousands overran the chat with simplistic orders of button inputs in the hopes of getting this bot to capture, name, battle, and heal Pokémon. Twitch Plays Pokémon demanded frequent check-ins and hours of participation from viewers. It was an event stream unlike most others on Twitch — think something rare and akin to Ninja playing Fortnite with Drake live — and Twitch Plays Pokémon ran it on an aggressively daily basis. It soon spawned memes (praise Helix), and viewers even helped to evolve the bot’s functionality. After more and more people tuned in, the whole “yell which buttons the bot should press” thing didn’t quite work anymore. So instead, the stream’s host allowed the group to argue in favor of anarchy or democracy, two play styles that would have their own dramatic impacts on the stream’s interactivity. Twitch Plays Pokémon “changed Twitch forever” in that way, as Twitch Studios director Marcus “djWHEAT” Graham put it this morning in honor of the iconic stream’s fifth birthday. “TPP created a movement,” Graham continued. “It changed the way people thought about the content they can and could create on Twitch. It changed the way that people thought about the impact that a viewer could have on an experience. It also made the impossible seem possible, Twitch beat the game.” And it took thousands of viewers almost an entire month to do so. The dynamics have changed, and the “game” works differently now, with players receiving things like tokens and badges to increase their influence. Twitch Plays Pokémon operates on a seasonal schedule, and at this point, it’s played nearly every Pokémon game, leaving the group to try out fan games instead. Most controversially, the original, anonymous creator of Twitch Plays Pokémon left the community in 2017 following alleged attempts to dox another member; a group of players handle the current streams. Amid all the change, there’s still something wonderful about watching a bunch of people play single-player Pokémon together. Graham and the rest of the Twitch Plays Pokémon community will hang out on the still-thriving channel today to celebrate the event’s birthday. (The bot is currently playing a fan-made Pokémon game, Pokémon Burning FireRed.) You can watch the original event in its entirety in the playlist below.